Introducing the FlyJSim 727 Series Professional V3, a continuation of FJS’s commitment to providing high-quality simulations for the X-Plane platform. ‘Relive the Golden Age’ with the 727 Series, an accurate recreation of the 727-100, -200Adv and Freighter models with their respective JT8D engine variants. Be prepared to challenge yourself, as you discover an airliner which offers a sophisticated, yet accessible simulation. Youâ€™ll find out exactly why this mid-sized aircraft became the aircraft of choice during the 1960s and 70s. Approachable for beginners. Are you intimidated by aircraft with high workloads? FlyJSim has worked tirelessly to ensure you can jump-in and fly, no matter the skill level. This aircraft comes with the default Laminar FMC integrated, making IFR flying as easy as a 737. A comprehensive menu system will ensure the easiest interface to access to the aircraft. We have also developed in-depth and accessible manuals, which will have you flying in minutes. A challenge for veterans. Looking for something more than just VOR-VOR flying? Turn on failures, and start counting up equipment wear on your aircraft. Our persistent failures system means you will be expected to properly check and maintain your aircraft at all times. Looking to fly a more interesting method of navigation? Then load up CIVA to access the full 727 experience (sold separately). Make sure you pay attention to your engines as pushing the engines too hard, or violent thrust commands will cause you some problems. Precisely dimensioned 3D cockpit. A 727 modeled using real dimensions down to the size of the switches. Incredible cockpit lighting. We went to town this update. Every bulb and fluorescent light has been faithfully recreated as per the real aircraft. See as every light including annunciators fill your cockpit with life! We have paid special attention to creating intuitive cockpit manipulation and interaction, including added mousewheel support. Great care has been taken in setting up just how you interact with the switches, knobs, and levers in the cockpit. Dial in your headings, course, altitude, and radios with ease, even while flying online. Following in our commitment to always have a fine-tuned and precise flight model that recreates the real-world airplane, you would expect no less from the FlyJSim 727 Series Professional V3. Three different variants of the JT8D engine with individual performance tuned across the full flight envelope, with input from real world pilots. The series includes the JT8D-9 for the 727-100, JT8D-15 for the 727-200 and the JT8D-17 for the 727-200F. Control surfaces driven using fully custom coding, simulating hydraulic pressures, blow-down effects and standby control surface modes in the event of failures. SP-150 autopilot accurately modeled including manual glideslope intercept mode and altitude capture. Accurate mode interlocks and animation. Autobrake system modeled to match real world data. Accurate simulation of an APU, ground power, generator paralleling and sync lights systems. They called it the ‘whisperjet’ but the sounds are anything but quiet. Continuing from the success of the 732 Twinjet, FlyJSim has developed an accurate and immersive FMOD sound pack, which provides a fully 3D positional experience. Experience the realistic screech of a 727 JT8D engine at full power. You will hear every engine, switch, and greased trim wheel. Definitely an experience you will want to keep the headphones on for! Every switch, button, annunciator and lever, recorded from real aircraft and accurately located in 3D. Ambient sounds, rain, airflow, gear airflow, flaps and spoiler rumble, turbulence shaking, touchdown, gear vibrations and braking. Air conditioning packs, interior and exterior, fuel pumps, APU, avionics, wipers, custom coded morse code identifications, custom coded real life Honeywell GPWS, all alerts and warnings. All sounds down to the buzz of the fluorescent lights are modelled, and optimized as to minimize CPU usage. Real internal/external JT8D recordings with correct sound levels and the characteristic powerful roar on takeoff. N1 and N2 modelled separately for better realism. Fly-bys have never sounded cooler! Take the visual experience and learning to the next level during replays. The FlyJSim custom replay system records far more parameters, allowing you to enjoy all those exterior surfaces in accurate motion, even after you have shut the plane down at the gate. Learn from your performance in replay while reviewing more instrument needles, switches, guards, and levers in the cockpit not previously provided by X-Plane’s native replay. An optional persistent maintenance and failure system is new in v3 to make your day more interesting. No more will you be flying a brand new aircraft each flight. Instead each flight will wear out your engines, APU, generators â€¦ and even airframe. Your flying technique will now have a direct bearing on failures and maintenance. As a pilot, you will have to learn how to handle an aircraft properly to avoid an unintended failure. This aircraft ships with newly redesigned, detailed manuals, procedures, and checklists. Ground call button integrated with the free open-source. Better-Pushback Plugin Plan and push from the gate without leaving the immersion of the cockpit. PilotEdge volume control and transmit/receive light. Adjust com volume and monitor communication directly from the center pedestal in the 3D cockpit. 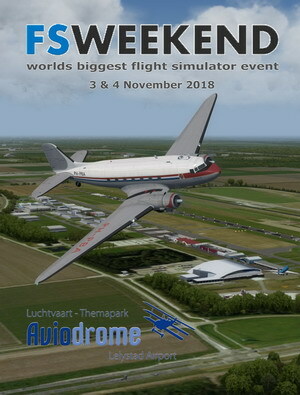 The ultimate experience in online ATC simulation.